Hey all this is the concept color version to a Spider-Man contest I'm entering. Basically you have to design your own spidy suit. This is Spider-Man Fusion. After months of Dr. Crawford serum, Spider-Man was thought to be cured from Man-Spider mutation. Several years past and it seemed the mutation came back and adapted to the cure that Dr. Crawford made for him. He thought he was doomed to turn to this spider creature permanently. Spider-Man sot for help and found him self in the hands of a trusted friend, Tony Stark. Tony saw Spider-man suffering and decided to commission him a suit, which would suppress his mutation until he found a true cure. The scientist in charge of creating this suit and to create the cure was Dr. Reed Richards and Dr. Henry Pym. They finally created this new suit and with it gave Spider-Man a few new abilities. The suit works like a pseudo version of the symbiotic suit the he wore before. The abilities that he will gain from the suit are extra strength, camouflage, special hearing and scaling armor. This suit also has a mental link with Spider-Man. It's like a blend of the symbiote suit, Nano-Tech Suit (Spider-Man Unlimited) and 2099 suit. I like it. This is pretty great! 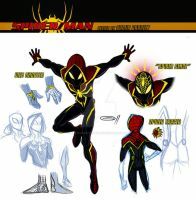 I think that the feet would look cool with the black webbing material past the blue division point, and be more consistent with the rest of the suit design as well. Excellent work. Looking at this i can see this type of thing in a TV show a little bit down the road but, might I make some suggestions. All together it a wonderful suit and gives a new look to Spider-man all together, in a good way. keep up the good work and great job on the picture. Hmmm... Good concept but I think it should be simplified. Oh alright, I'll check them out. I really want you to see my version of the hero. You should add me bro. I'm uploading soon. Now that I think about it, this costume could also make an excellent Scarlet Spider redesign while still paying tribute to Spider-Man in terms of the blue and black accents (blue for the original red-and-blue suit and black, of course, for the symbiote suit). After seeing this costume from so many angles thanks to you, that's what I've decided . . . and speaking of the Scarlet Spider, that blue-washed "Synchro" mode also reminds me of the "Asgardian Spider-Man" costume Ben Reilly briefly fantasized about when trying to come up with ideas for his big comeback as Spider-Man (in Sensational Spider-Man #0). If you want to, that's cool. Go at your own pace, man. Wow! I like this one, too! The flow, and how it almost seems like a techno-suit. Plus, the eyes on both your suits are a (dare I say) deviation from the regular, and I really enjoy that. Hmmmmm... Probably Fusion, but I liked the concept art of Madame Web more. Good design, what I liked about it is the possibility to camouflage(Something that will help Spider a lot) and the scale idea.